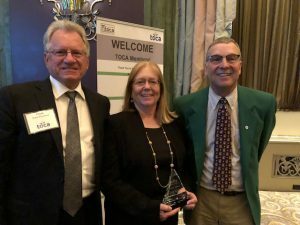 The TOCA Hall of Fame is designed to recognize the cumulative accomplishments of deserving communicators who have made outstanding contributions to the turf and ornamental industry. The 2018 inductee was Felicia Gillham. Nominees will be evaluated by the TOCA Hall of Fame Committee (appointed by the TOCA board of directors). The committee will select from a slate of up to 10 candidates per year to be considered for entry into the Hall of Fame. A maximum of three candidates will be elected into the Hall of Fame each year. The next selection of Hall of Fame recipients will be recognized at the annual TOCA awards banquet, May 2019, in Charlotte, North Carolina. For more information, contact the TOCA office at: toca@gandgcomm.com or 952/758-6340.